My name is Chris Rouse and I represent New Clear Free Solutions an environmental group based in New Brunswick. We have submitted both Provincially and Federally a carbon tax policy which publicly invests the carbon tax into renewable energy and continually reinvests a portion of the return on investment also into renewable energy until a renewable portfolio standard is reached. The reinvestment creates an ever growing amount of money to be able to transition to a very low carbon economy. This policy provides all of the capital needed to make the transition and changes the conversation from how much is this going to cost the Provinces to how much money can it make the Provinces. In August 2016 the US Energy Information Administration released its 2016 Annual Energy Outlook. We have updated the Carbon Tax and Investment Plan using the latest cost and performance data from this report. The update also provides additional financial details and extended the detailed Integrated Resource Plan to include a 2060 Stage 2 Renewable Portfolio Standard for New Brunswick. This update also includes additional sensitivity analysis, and provides estimates for each Province and Territory and Canada as a whole. The Carbon tax will allow Canadians to invest in our abundant renewable energy resources with our provincially owned integrated electric utilities. This will stabilize our energy rates and provide billions each year in net profits for each Province. The transition to a low carbon economy is going to require billions in capital investments with an expected return on those investments. If the capital is debt financed or privately financed they will earn the billions in interest, if Canadians are allowed to invest, using the Carbon tax revenue, Canadians will earn the billions in interest. The decision to publicly finance or to private or debt finance the transition is arguably the most important decision that needs to be made. I am happy to offer my assistance in developing a detailed integrated resource plan similar to the one I have prepared for New Brunswick for any of the Provinces or Territories. I would also like to offer a detailed presentation of the policy or answer any questions that you might have. New Clear Free Solutions, a citizen based energy think tank, will be presenting a new Carbon Tax plan to the Select Committee on Climate Change. 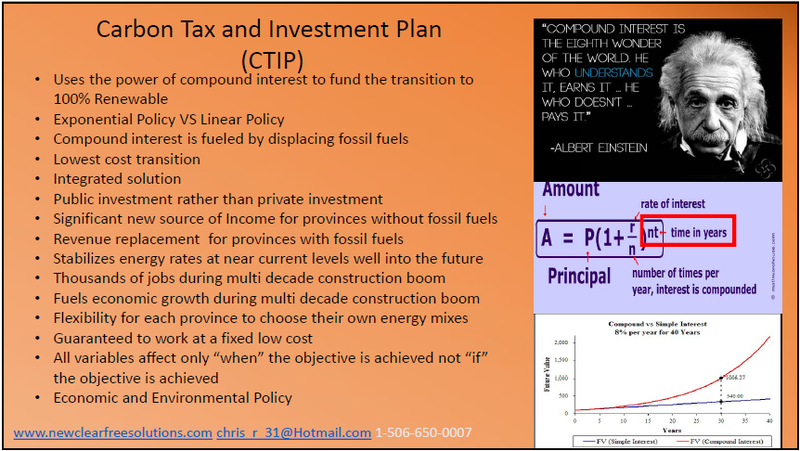 The Carbon Tax and Investment Plan (CTIP), takes advantage of compound interest to transition to 100% renewables. The select committee will hear New Clear Free Solutions at Delta Brunswick, 39 King Street, Saint John, N.B. at 5:00 in the evening, on September 7. “It didn’t take us long to figure out that the key to a successful plan was harnessing the power of compound interest” said Chris Rouse, founder of New Clear Free Solutions. He began work on the CTIP following last year’s EUB rate hearings where he also participated as an intervenor. At that time, he was asked by EUB staff lawyers how he thought a carbon tax might be implemented. “The CTIP taxes carbon and then invests that tax into renewable energy. The revenue generated from the renewables is then continually reinvested to exponentially transition to 100% renewable.” said Mr. Rouse. Recently there was a lot of press regarding a whistleblower letter from within the CNSC that pointed out 5 cases in which important safety information was withheld by CNSC Staff from the Commission Members about reactors in Ontario. Today July 28 2016 I wrote to the Minister of Natural Resources, Hon Jim Carr, to explain that very similar incidents are occurring with regards to withheld information by the CNSC staff from the commission members about Point Lepreau. To read the letter and attached Appendix describing the 5 cases and our recommended solutions follow the below link. New Clear Free Solutions, a citizen based energy think tank, will be presenting a new Carbon Tax plan to the Energy and Utilities Board. 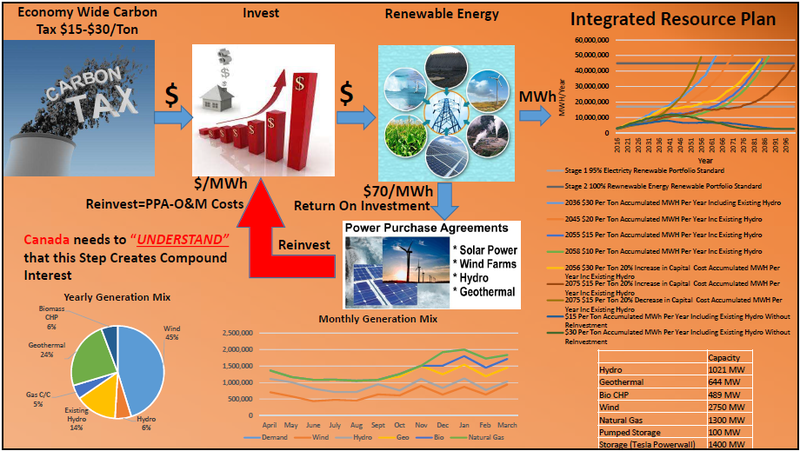 The Carbon Tax and Investment Plan (CTIP), takes advantage of compound interest to transition to 100% renewables. The NB Power rate hearings will be held at Delta Brunswick, 39 King Street, Saint John, N.B. onTuesday evening, May 10. “It didn’t take us long to figure out that the key to a successful plan was harnessing the power of compound interest” said Chris Rouse, founder of New Clear Free Solutions. He began work on the CTIP following last year’s rate hearings where he also participated as an intervenor. At that time, he was asked by EUB staff lawyers how he thought a carbon tax might be implemented. “The CTIP taxes carbon and then invests that tax into renewable energy. The revenue generated from the renewables is then continually reinvested to exponentially transition to 100% renewable.” said Mr. Rouse.